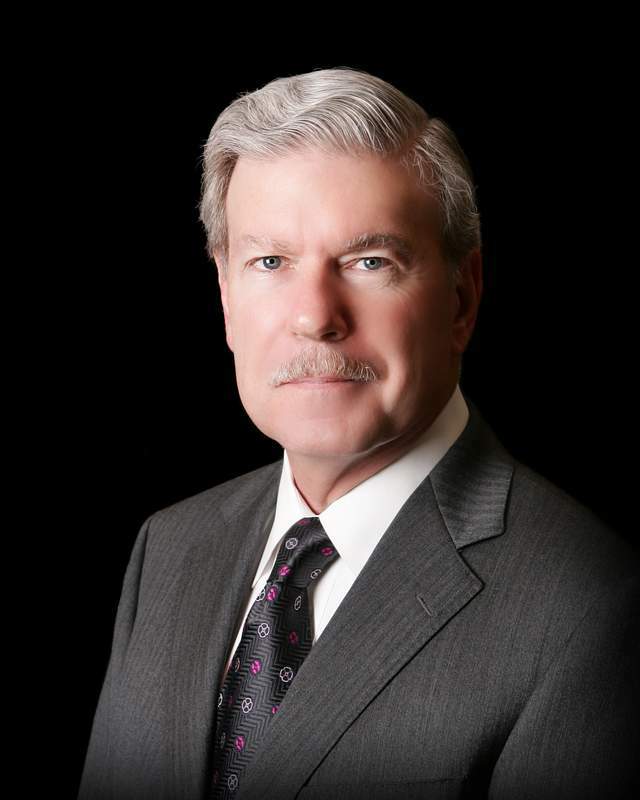 Mr. Johnson is a civil trial lawyer and has been in private practice in Wichita, Kansas since 1979. Prior to entering private practice John served in the United States Air Force as a Captain in the Judge Advocate General’s Department. John handles primarily complex civil litigation matters which include commercial litigation, medical malpractice, aviation accidents, products liability, and motor vehicle and truck accidents. John’s distinguished service as a trial attorney has earned him membership as a Fellow in the International Society of Barristers and he has been past Kansas District President of the American Board of Trial Advocates and currently serves on the National Board. He also is past President of the Kansas Trial Lawyers Association and a former Board Member of the American Association for Justice. John has presented lectures to the American Association for Justice, the Kansas Trial Lawyers Association, the Kansas Bar Association, the Wichita Bar Association, Washburn Law School, and has made a presentation for the American Board of Trial Advocates. Martindale-Hubbell Law Directory has rated John at the highest AV®* rating for lawyers. He has consistently been included in the list of Missouri and Kansas Super Lawyers and has been recognized by Best Lawyers in America® for over 10 years. John’s practice extends beyond Kansas with cases in Oklahoma, Texas, Colorado, Missouri, Georgia, Nebraska and Minnesota. A) Following routine knee surgery, the patient was placed in a long leg cast. Upon follow-up with her physician, the patient complained of severe pain on the side of her knee under the cast. The physician dismissed the claims although they were made repeatedly by the patient. It was later discovered the patient had developed a severe infection and when it was left untreated, destroyed a significant portion of the bone mass in the patient’s knee. This resulted in a second hospitalization, further surgery to repair the damage, and permanent disability. A jury trial resulted in a verdict favorable to the plaintiff. B) A 30-year old man went to the emergency room in a southeastern Kansas hospital complaining of chest pain and shortness of breath. Although he exhibited classical symptoms of a pulmonary embolism, the patient was sent home. He subsequently developed respiratory arrest and died in front of his son. The case was resolved by settlement among the parties without the requirement of a trial. C) An over-the-road trucker went to his family physician requesting medication for sinusitis. He was given a decongestant along with an antibiotic. Upon taking the antibiotic, he suffered a severe reaction and went back to the physician describing the symptoms he suffered from. Rather than recognizing the symptoms of an allergic reaction to the antibiotic, the physician told the patient to continue taking the drug. When the drug was taken the second time, the patient went into anaphylactic shock and died. This case resulted in a successful settlement resolution with the involved parties. D) A gentleman who had been a smoker all his life, although he had quit five years previously, had gone to his family practice physician for a physical. During that physical, a chest x-ray was taken which was reviewed by a radiologist. Approximately 18 months later, during another physical examination a second chest x-ray was taken which revealed a tumor in his lung. A comparison with the first chest x-ray indicated the tumor was present on that x-ray and had grown almost three times its size. The 18-month delay in diagnosis denied the patient the opportunity for surgical intervention and he subsequently died of metastatic cancer. A successful resolution in favor of the plaintiff was made. E) A lady with long-standing mental illness sought the counsel of a psychiatrist who took advantage of the woman’s condition and had sexual relations with her. While a cover-up was attempted to conceal the psychiatrist’s actions, the facts were brought out during exhaustive discovery efforts and the case was settled. The psychiatrist was brought before the State Board of Healing Arts and disciplinary action was taken. F) A young couple had a premature infant who was in the pediatric intensive care unit at a local hospital. On the third day after birth, the infant was in stable condition and showed all signs of a normal development with an expectation of an early discharge from the hospital. However, the child had a nasogastric tube inserted through her nose for feeding purposes and an IV line in her scalp for fluid administration. A pediatric nurse confused the infusion pumps regulating the nasogastric tube and the scalp IV and placed formula for infusion into the scalp IV. As a result of this infusion of formula into the infant’s blood system, a pulmonary embolism developed, causing the child to suffocate to death. An out-of-court settlement was secured from the hospital without the necessity of formal litigation proceedings. G) A twenty eight year old woman underwent surgery for a congenital jaw defect. During surgery, the anesthetist allowed her blood pressure to remain low for an extensive period of time. Following surgery, this lady noticed a loss of sight in her right eye. She was advised this condition was temporary and when it persisted suit was filed. The contention at trial was optic nerve damage occurred as a result of the prolonged drop in blood pressure during surgery. John called as a witness, one of the foremost authorities in the nation on neuro-ophthalmology. The jury returned a verdict in excess of one half million dollars. H) A husband and father woke up in the middle of the night with an extreme headache, was nauseous, dizzy and had some problems with urine incontinence. He was taken to a local hospital where two CT scans of his head were taken. The radiologist read both scans as normal. The treating physician then ordered a spinal tap which was bloody, indicating a cerebral bleed. The spinal tap was dismissed and a second tap was ordered. It too had blood in it, but to a lesser degree. The ultimate diagnosis was meningitis. After ten days in the hospital, the gentleman was discharged. The next day, he suffered a ruptured cerebral aneurysm and died three days later. Suit was filed claiming the radiologist misread the CT scans which showed an evolving aneurysm that could have been treated. The treating physician was included in the lawsuit for failing to acknowledge the bloody spinal taps. The case was settled before trial. I) Complaining of a sore throat, a 55 year-old man went to his family physician and saw a physician’s assistant. The PA diagnosed his condition as an abscess and prescribed antibiotics. The supervising physician did not review the diagnosis and did not follow-up when he saw the patient at a later date. Ten months later the diagnosis of tonsillar carcinoma was made. At that point, the cancer had metastasized which significantly reduced the patient’s chance for survival. He died before a significant settlement was made by his widow. J) A 35 year-old man fractured his ankle while at work. The injury required surgery and screws to secure the bone fragments. Even though the surgical wound continued to drain and later an infection was diagnosed, his surgeon failed to remove the screws and administer appropriate antibiotics. The infection became so severe a below the knee amputation was required. The case against the orthopedic surgeon was settled right before trial. A) In addition to medical negligence cases as illustrated above, John also is involved in other complex litigation matters involving personal injury. A noteworthy case involves a tragic accident that occurred on the Kansas Turnpike in April several years ago. As is the custom in the Flint Hills, the ranchers set fire to their grasslands to burn them off in preparation for the upcoming growing season. One particular day a rancher had his pasture burning when fire, unbeknownst to him, got into the turnpike right-of-way. Several mothers were taking their children up to Topeka, Kansas, to meet with the governor the following day concerning the annual Twins Day proclamation. One set of twins was riding in a van along with their older brother. They were sitting in the rear seat when the driver of the van encountered smoke from the range fire drifting across the highway. Visibility was reduced to zero. The van slowed to almost a stop when a pickup truck pulling a fifth wheel trailer entered the smoke traveling at 70 mph. The pickup truck ran into the rear end of the second van, knocking it into the right-of-way where the grass was burning. One of the twins died in the arms of his mother while the other was seriously injured. Suit was filed against not only the landowner but the owner and employer of the pickup that entered the smoke going 70 mph. While a successful settlement was reached as a result of the lawsuit, more important issues arose from this tragic accident. At the time of the accident, Kansas had a $100,000 statutory limitation on damages that could be recovered in a wrongful death action for mental anguish and bereavement. That meant the parents of the young boy who was killed could recover $100,000 for their grief resulting from the loss of their son. A legislative initiative was brought by the Kansas Trial Lawyers Association using this case as a prime example of the inequity in the wrongful death law. In 1998, Governor Graves signed legislation raising that $100,000 limitation to $250,000. B) While traveling during his employment, a middle aged man was traveling on a state highway in south central Kansas. As he entered the intersection, he was broadsided by a pickup truck travelling in excess of 60 mph and died instantly. Although the pickup was required to stop and yield the right of way, the driver ignored the rumble strips, stop ahead signs and a flashing red light. The wrongful death claim was settled for $650,000. C) In Northwest Kansas a man was attempting to pass a flat bed truck that was used for servicing pivot sprinkler systems in the largely agricultural area. During the passing maneuver, the truck started to turn left forcing the car to swerve left wherein it hit a culvert and rolled. The impact ejected the driver from the car. The driver died the next day from his injuries. A lawsuit was filed representing the surviving spouse and four children, one of which was a minor. Liability was hotly contested and the case went to trial in Colby, Kansas. The defendant truck driver and his employer contended the truck had its left turn signal on when the following vehicle tried to pass. After deliberating for over 10 hours, the jury returned a verdict in favor of the plaintiff in the amount of 1.3 million dollars. A) Premises liability is an area of the law which can be very challenging. A young man in his early 20s went to a local restaurant for breakfast after being out on the town one weekend night. After being seated in the restaurant, the manager seated a group of individuals who obviously were intoxicated, loud and obnoxious. One of the intoxicated individuals started taunting the young man. Rather than asking the boisterous crowd to leave, the manager instructed not only the perpetrator of the commotion to leave but also the young man who had been minding his own business. The police were not called nor were any other security measures taken to safeguard the young man who had been evicted from the restaurant. Upon reaching the parking lot, as was expected, the intoxicated individual attacked the man, knocking him to the ground, wherein he struck his head on a parking slab. He sustained spinal cord injuries which resulted in permanent paralysis. It was later learned the intoxicated individual was known to the manager of the restaurant and had been a problem previously. Suit was filed against the restaurant for the injuries sustained and resulted in a favorable settlement to the man who had his life changed forever as a result of this incident. B) As a result of a fire in a hotel in a prominent Texas city, five individuals lost their lives. John represented the family of one of these individuals who had been staying at the hotel on business. Initially suit was brought against the hotel owners along with the manufacturers of the carpet and carpet padding. It was determined by forensic analysis that all five individuals died not from burns but rather from inhalation of toxic fumes emanating from the carpet, carpet padding, and wallpaper. Upon settlement with the hotel owners, an agreement was reached to jointly pursue liability against the textile manufacturers. The five cases were consolidated to be tried at once and John was selected as lead counsel for that trial in Texas. After two days of trial, the case with the remaining defendant was settled. C) A single mother worked with an education program teaching grade school kids in summer academies sponsored by the Kansas National Guard. Teaching sessions were held in an aircraft hangar. This young lady went to open one of the doors which was operated by an open exposed drive shaft assembly. She had to stand next to the drive shaft while the door opened. Her hair got entangled in the spinning shaft resulting in one third of her scalp being ripped off her head. Her injuries were severe requiring an airlift to the Kansas University Medical Center. She underwent numerous surgeries. Suit was filed against various construction companies, product manufacturers, and the State of Kansas. All defendants, except for the State settled before trial. At trial, the jury found the State 100% at fault and awarded damages in excess of $600,000. The case was appealed by the State and a new trial was ordered. Subsequently, the state negotiated a settlement. A) Another area of interest involving John’s litigation practice is commercial torts and business malpractice. One particular noteworthy case involves the construction of a Marriott Hotel in Wichita. The developer of that hotel had an employee who supervised his real estate transactions. It was the employee who brought the idea of developing the Marriott in Wichita and worked out an agreement with his employer to receive a commission if in fact the deal was done. When the employer refused to pay a commission at the completion of the project, the employee sued for the commission on that project. The case resulted in a jury trial and a verdict in favor of the plaintiff. B) An interesting case involving accounting practices was also tried to a jury with John representing the plaintiff. The plaintiff was a retired corporate executive of a major corporation. He had previously done his own tax returns but as a result of stock transfers and a retirement package he received from the corporation, he had a local branch of a national CPA firm prepare his taxes. A gross error was made in the calculation of those taxes and determination of refunds. Several years later, pursuant to an IRS audit of the corporation, it was learned that a mistake had been made in the calculation of this individual’s tax return and subsequent refunds. He was assessed not only an amount for back taxes but also interest and penalties. A suit against the accounting firm resulted in a jury verdict in his favor for the damages he had sustained. C) John represented a woman from Idaho who entered into a contractual relationship with a Minnesota company to produce a mineral supplement. The company reneged on its contractual obligations. After a week and a half of trial, the jury found in favor of John’s client, awarding a substantial sum for damages. When he was 17 years old, John received his private pilot’s license and subsequently received a commercial pilot’s certificate, an instrument rating, and a multi-engine rating. He has been the owner of not only single engine but multi-engine aircraft. He has used his aviation experience in representing individuals in aviation-related matters. These matters include aviation crashes, product liability issues, and the defense of pilots pursuant to Federal Aviation Administration enforcement actions. This representation of pilots extends not only to the Federal Aviation Administration but also to hearings before the National Transportation Safety Board. A particularly tragic case involved a business jet that crashed while on approach to the Goodland, Kansas airport. John represented the surviving spouse and children of the co-pilot. The FAA found the pilot was negligent which was the proximate cause of the crash. Investigation into the matter revealed the pilot had just received his training in the jet from a national flight training academy. Evidence was uncovered the pilot was never proficient in the high performance jet. The case was settled after suit was filed against the training academy. The examples set forth above are merely illustrative of the types of cases John has handled. They certainly are not exhaustive of his litigation experience.